Off to the National Fruit collection at Brogdale. Typically for this weekend, it started to pour as we got there. Took in my punnet of mystery eater apples, gave them a cheque and noticed it gave me a free tour which I was going to take anyway. Saved me a fiver! Paid for P. then found we were the only ones going. I ended up feeling very guilty as it was rotten weather and even a golf brolly didn't help much. We started off in the pears, and I was given an oriental pear, more like an apple in shape and very firm, but wow so juicy. 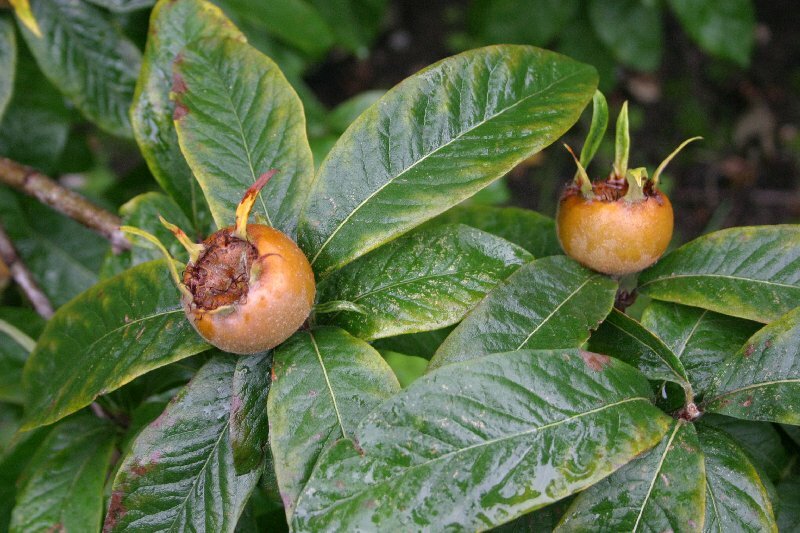 Then to the quinces :) and medlars: the latter are great fun but I'm not sure I'd want to let one rot so it was edible... Moved onward through the rain to the beurré pears (smoother texture) and then finally to some wild ones, before passing through the bare area where some trees had been before being dug up 4 years ago. 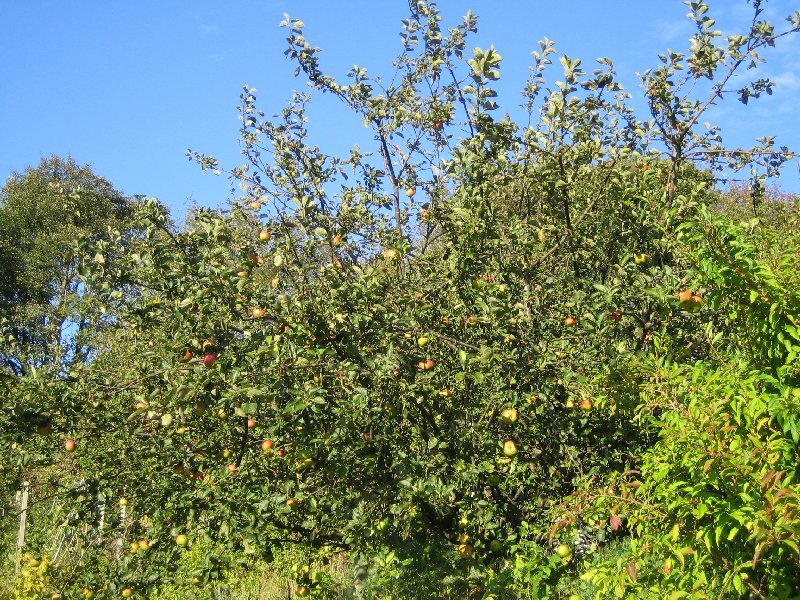 Because all common UK tree fruit (apples, pears, quinces) are of the rose family, they suffer from replant syndrome and so the area is now fallow for some years. Into the apple area, P. gave up and went back to the car after getting the shivers, leaving me to carry on asking questions. There were thousands of trees. 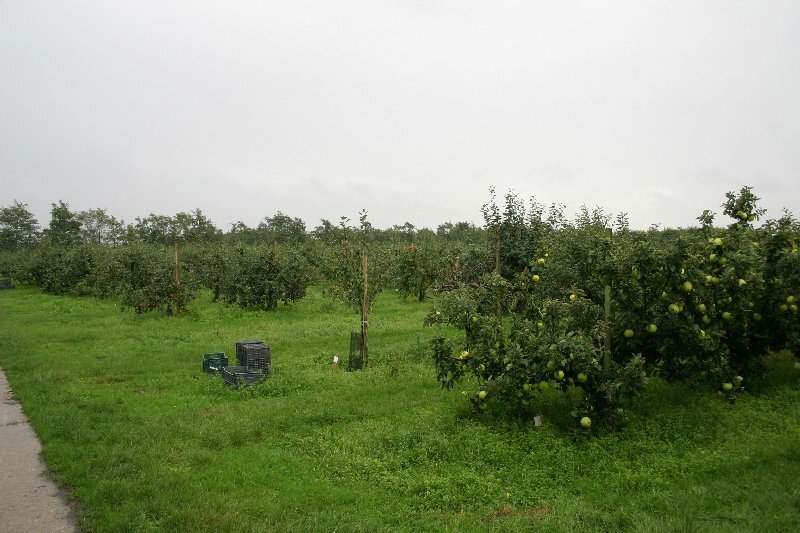 This was definitely the time to visit - between the early apples and mid-season ones, as some of the former were still there and the mids were just being picked with the lates not far off. I was given a Groninger Kroon to add to the pear I already had stashed in the bag (and whose name I can't remember!) . We walked round the mid-seasons, seeing some that will root from branches which touch the ground (the original Bramley did this) and discussed cooker-eaters and the possibility that Dad's got a Blenheim Orange. (He hadn't, but I got another sample apple!) I also was shown Coster varieties, which were huge apples often sold by the Costermongers in the East End in the 19th century, and some that were ‘fluff' apples, used for purée. And just as we were leaving the field (after having seen a fraction of it!) I spotted one that looked identical to my tripover. I then had a third sample, this time a Reverend W. Wilks. The picture doesn't do it justice, but the sample I took home is definitely very very similar. At last we got in and tried to dry off a bit. P was in the car, and came out to have a coffee and some lunch. Typical British cooking - various pies and flans - so I had cheese and potato pie and he had a layered sausage and apple pie, giving us some ideas for things to make. Furtled round the plant sales area and finally decided to get a Quince Meeches prolific (as per label) or Meech's Prolific (as I suspect it should be spelled). It's on a Quince C rootstock, which is slightly smaller than Quince A (should I ever get a pear or two as well). Only just remembered to get a catalogue of varieties for allotment reference in general (and Yvonne/Kate in particular!). I saw one of these - the prolific wasn't a joke... don't think my small tree will be that big very quickly though. It was fun getting it in the car! Ended up through the back seat and the gap between front chairs, with the top leaves on the radio. But it didn't obstruct driving so all got home in one piece. More rain but not as much as going! Got back to discover 8mm had fallen there. A fairly wet week, with another 13.5mm since I last updated. Up to 29% already. But today dawned beautifully clear though cold, and I didn´t go up until late afternoon. Immediately after I arrived, so did Dave the manure man, and I phoned Chris to check if she´d ordered any. She hadn´t, so I intercepted the tractor on the way out. Dave will now phone one of us when he´s ready to drop off the load. Must get cash out and make sure I don´t spend it! Chris reappeared and I passed on the info. 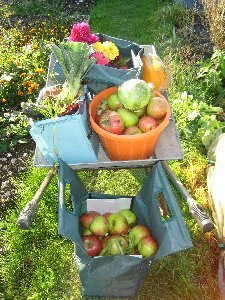 I´d gone up armed with three heavy duty Waitrose green bags and proceeded to fill two with apples and one with marrows, beetroot, carrot thinnings and dahlias. Yikes. Had a chat with Vince about the upcoming committee meeting and I need to write something about the harlequin ladybirds for The Grower. Nearly had a struggle carrying the load back but Chris kindly gave me a hand back to the car. She now has her promised red cabbage and I have a storage headache. Solved some of it by giving a marrow and loads of apples to next door. Help! After laying out all the more decent apples in mushroom boxes, and cooking some, what do I go and do? Pick almost duplicate bagfuls to yesterday! 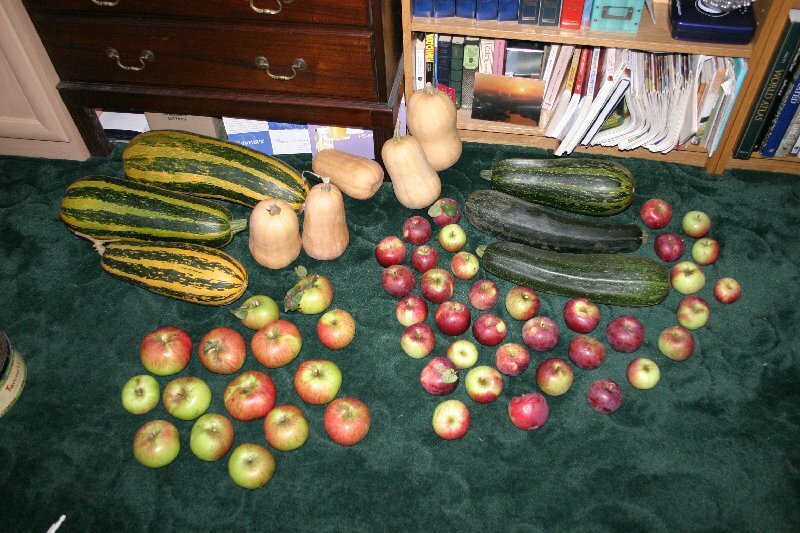 Three more marrows and heaps more apples. Again gave away some of the cookers but am still left with loads. One of them weighs over a pound and a lot of others aren´t far off... Now can´t see the floor again. I think there will be donated fruit at Church tonight. Very much a rain note. We´ve had 87% of the average rain expected in October already (26mm yesterday!). We only need another cm to get to average, and the forecast is more overnight. Off to US this weekend for work, so hopefully I´ll get a break from the rain for a few days till I get back on Tuesday morning. Produce! The ripening marrows and butternuts were there before (no idea where to put them!) and now I´ve got the three green marrows, and this little lot of apples... the eaters are the smaller ones on the right. 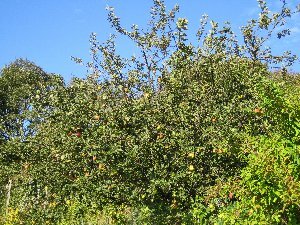 Not too wet today, and after missing yesterday's planned weeding session at the allotment, found myself up to my ears in apples again. With seeing the folks tomorrow, I had to get them as many as I could carry. The first frost is imminent and so there's a limited time in which I can pick. That and the clocks go back on Sunday. Ended up spending the best part of a couple of hours picking solidly. Ended up with a bagful of eaters, a bagful of Bramleys and a bucketful (literally) of Bramleys. Also got a small punnet of autumn raspberries, a cabbage, some carrots, a couple of leeks, one dug Sarpo potato (for potato and leek soup) and a load of beetroot. Only the carrots are due to stay here, and some of the apples. I've now used up most of the mushroom boxes which are full of apples, and I expect that I'll freeze a few of the Bramleys too. If I can find room in the freezer. Still didn't get any weeding done - and needed the wheelbarrow to get everything back to the car! Update on the rain: we are now at 160% of the October average for the Chilterns, and the excess has taken us to average for the past seven months. It´s thrown it down for the past two weeks, which was frustrating given I´ll soon have no daylit evenings to go up in. 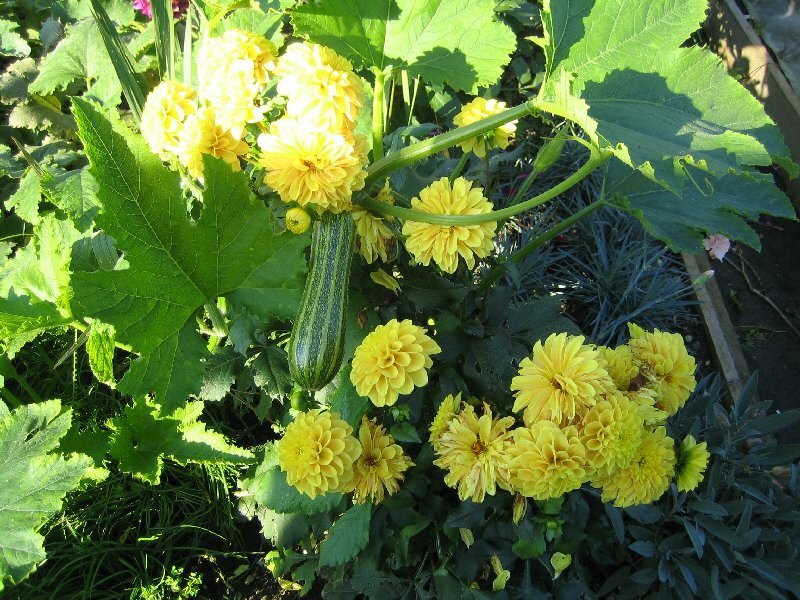 The yellow dahlia and a wayward marrow! OVERVIEW - still a lot of green, but for how much longer??? The dreaded turning back of the clocks, and finally a lovely day. Managed to sort out the garlic (70 cloves now planted in modules - home saved ones this year thanks to the garden centre being sold out!) 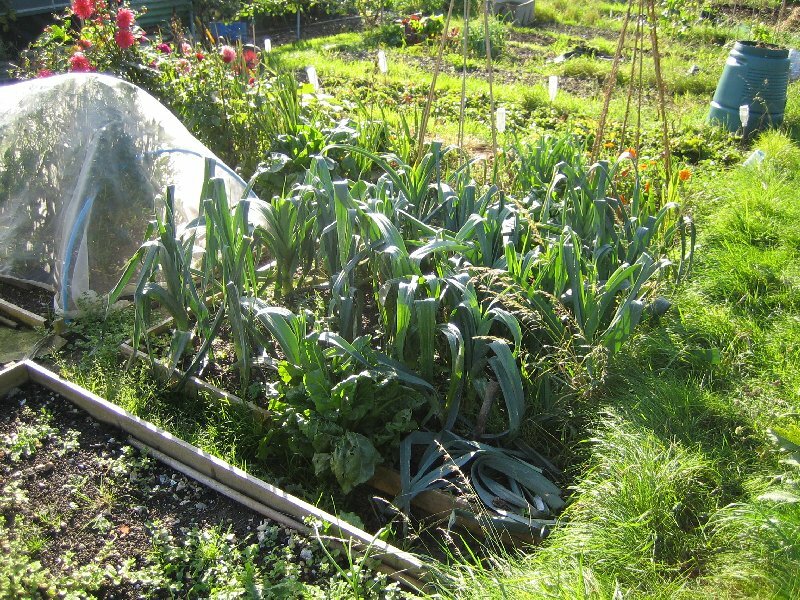 and overwintering onions (back to the Swifts of two years ago, which grew very well indeed). I need to weed the beds they are going into still, but the modules give me a bit of time. Decided to weed at home instead, as I needed to do the front garden before the falling sycamore leaves got too bad for me to be able to see the soil! Finished off in the dark with the floodlight on. First frosts forecast for tonight. Appropriately enough, the old Celtic festival that is Samhain used to be held to mark the end of harvest and the start of the frosts. I have been thinking about the crops I´ve grown this year, and how I´ve grown them. 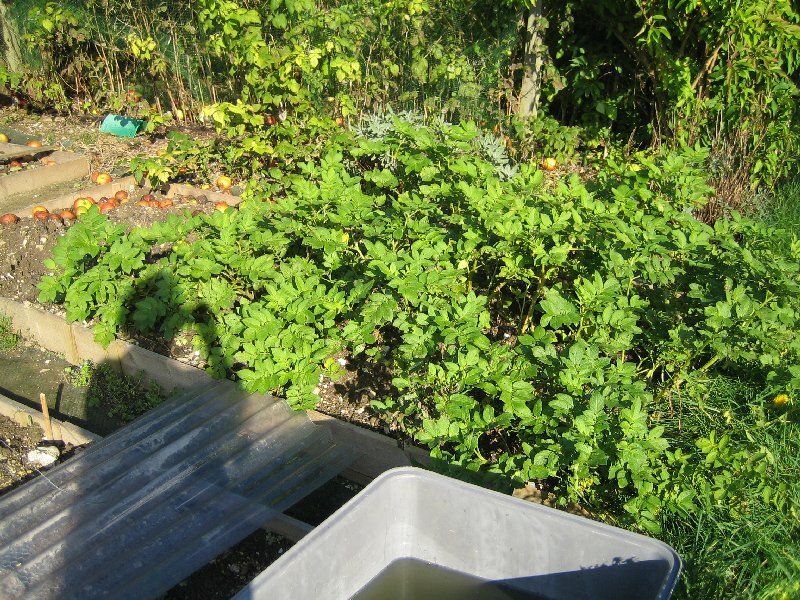 I made a conscious choice back in the spring to water as little as I physically could, only doing beans, marrows and seedlings on a regular basis. 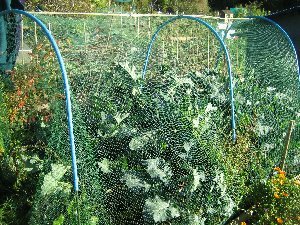 I haven´t watered the majority of things in the plots and have had one of the largest harvests since I first became an allotmenteer. Despite taking several goes to get French beans and carrots to go and an incredibly dry June! And as for the red cabbages... rain has been average, so it shows that you don´t have to water everything all of the time, and I even got a massive marrow without actually watering the plant. So there I have it. Maybe it won´t work as well in very dry years, but I can live with that. 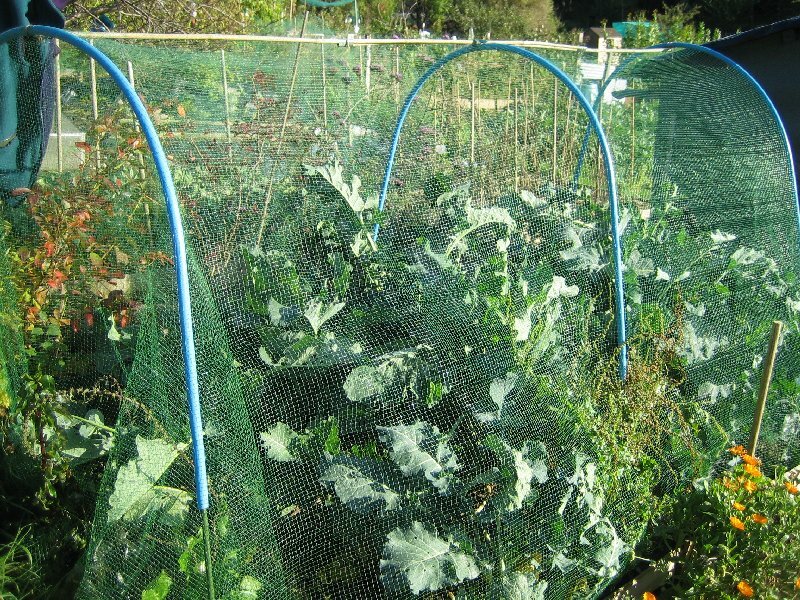 Pity the runner beans never did much, but nobody´s did. Have added a metcheck `sticky´ box to the weather page if anyone wants to see what´s (theoretically) happening here!